We know you have many choices for Auto Transport Lead Providers. However, with iMover Leads not only will your receive high quality auto transport leads, but it is backed by our professional customer service. At iMover Leads we specialize in generating auto transport broker leads exclusively for the auto transport industry. Join our network and immediately begin receiving leads you can count on for your auto transport business. Most importantly, when you join our transport leads program and you will receive FRESH, real time, high quality auto transport leads. We are the experts in online marketing, and our leads are fresh, and of the highest quality. Increase your business today by joining our transport leads program. Each unique quote request that we generate is sent to 10 auto transport brokers. iMover Leads guarantee’s a maximum cost of no more than $1.25 per lead. However, throughout the year our lead cost averages around $1.00-$1.25 per lead, depending on seasonal fluctuations. If you would like to start receiving our leads, fill out our online application. Once you have e-signed our short, simple e-sign application, within minutes we will process your application, and activate your leads. There are NO CONTRACTS, and our services are month to month. We have NO SETUP FEE’s and you are free to start and stop your leads at any time. A lot of Auto Transport Lead Providers boast about how cheap their leads are and how with them you receive more leads for your dollar. Be careful though, because it is more important to have quality leads versus a large quantity of cheap leads. 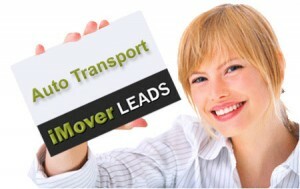 With iMover Leads, that is not the case, our transport leads are not only of the highest quality but affordable too. We offer real time, high quality auto transport leads that you can afford and back it with the best customer service in the industry. It’s not hard to see why we are the best choice in Auto Transport Lead Providers. We believe you should only be paying for high-quality leads you can depend on. That is why if you receive a lead that you are not able to call and e-mail due to “bogus information” we will credit you at the end of your billing cycle; Or send you more leads to make up for them. In an effort to increase our quality we also have setup a duplicate tracking device within our system to flag and NOT send any duplicates to our customers. We are set up and integrated with all the top auto transport software providers, like Jtracker. If we for some reason are not already integrated with your software company we will personally work with their IT developers until we are. All you have to do is let your software provider know that you would like to start receiving leads from iMover Leads. They then will provide you with a “unique” email address, that you will add to your leads application, and within minutes you can start receiving our auto shipping leads. Give your business the extra SALES BOOST you’ve been searching for! Why purchase our leads? With the industries highest conversion rates, increased rates of return, and superior customer service, what are you waiting for? See for yourself why we stand out from other Auto Transport Lead Providers. Call us today to start receiving our auto transport leads, (888) 221-6602.